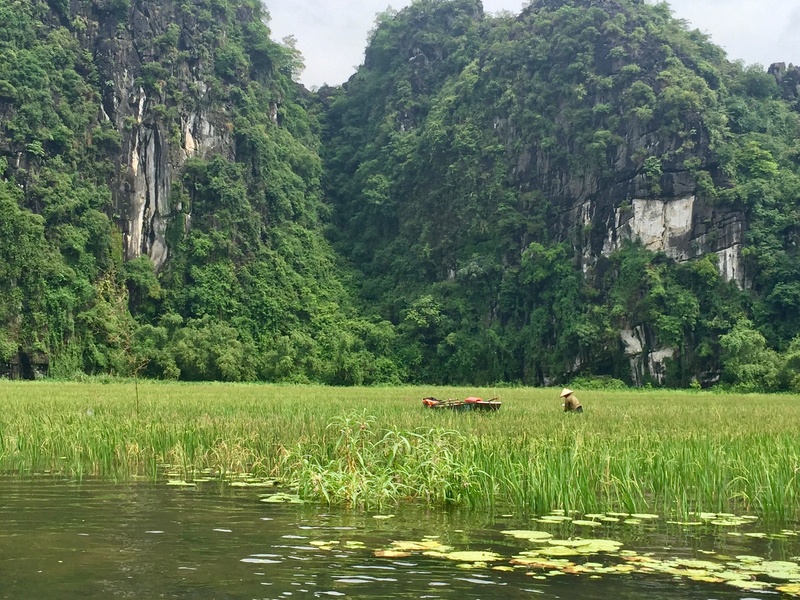 Our first stop on our full-day adventure was to Hoa Lu, the former ancient capital city of Vietnam. The tranquil scenery should be enough for you to visit this city, but the temples aren't half bad either. 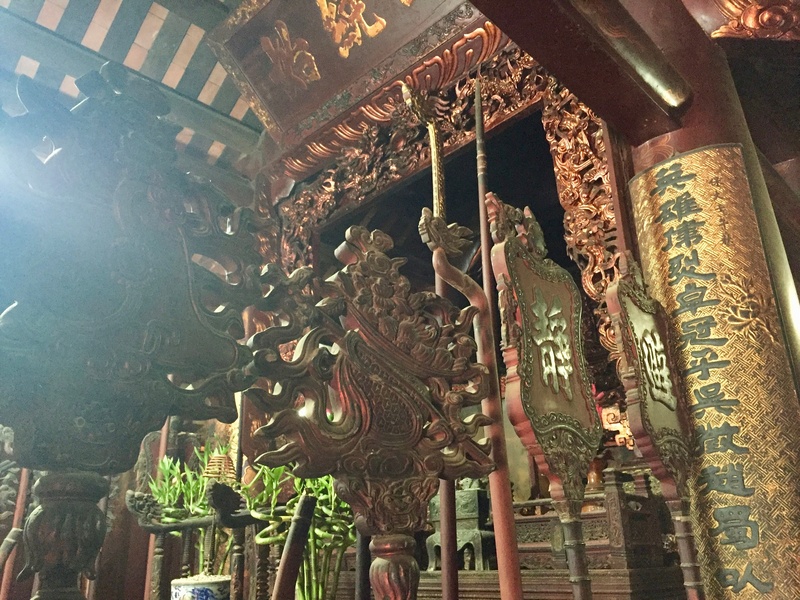 They were built during the Dinh and Le Dynasty (968 to 1009) to honor the Emperor at the time. All that remains in the temple is the Emperor's golden crown, encased at the top of a shrine within the temple. But, between the towering carst mountains surrounding the temple and the stone lions guarding the gates, his royal presence is still very much felt here. We spent an hour or so exploring the temples, relishing in the quiet atmosphere and enjoying the scenic views. We had a long itinerary to fit in that day, so our guide soon gathered us back on the bus and brought us to our next stop: lunch. The buffet lunch was included in the tour price, but they surely didn't skimp on it. We pulled up to a big, open-air building with long, wooden tables packed with other tour groups devouring plates of food. The lunch was buffet-style. We quickly found a seat and made our way to the buffet full of fresh fruit, salads, cooked vegetables, various noodle and rice dishes, different meat dishes, soups, french fries, baguette bread... the list was endless. We spent the time enjoying our meal and chatting with the fellow travelers in our group. Next stop on our tour? The river cruise, of course! 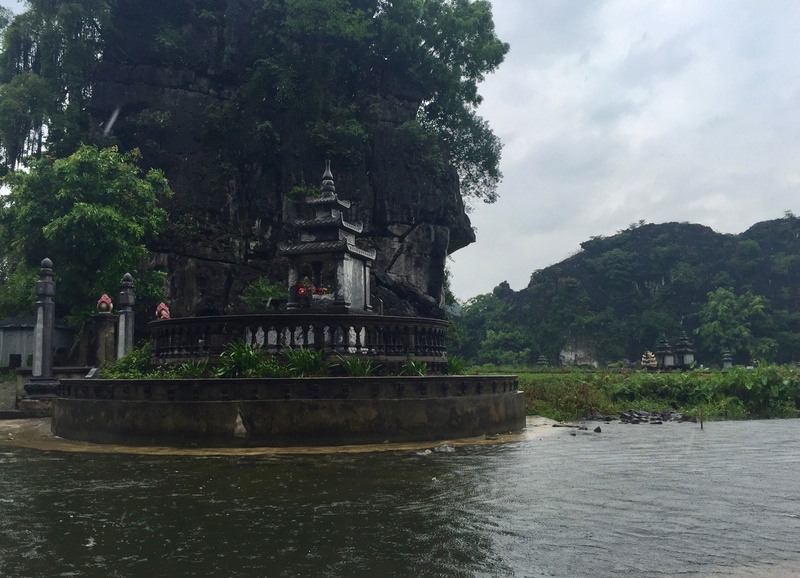 We hopped back on the bus and drove another 20 minutes to Tam Coc, a quaint town nestled in the mountains. There, we zipped up our raincoats and pulled on the neon-orange life vests before sitting in our own private boat. We greeted our rower for the afternoon, a middle-aged Vietnamese woman full of laughs. 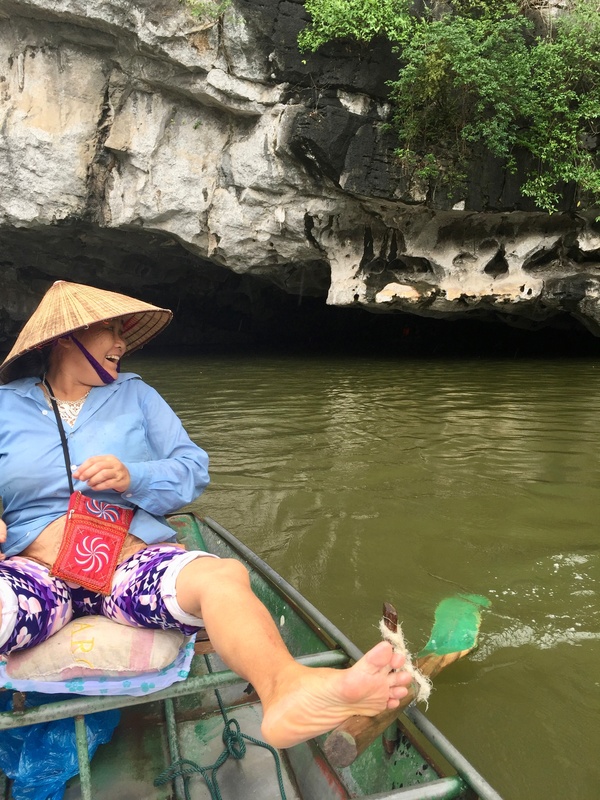 She was ready to row us down the Hoang Long River. What's even cooler is that she rowed the entire way with her feet... Yes, with her feet! That's some serious talent. Our river cruise was over all too soon. We thanked our rower (and thanked the weather gods they kept the cloudy, rainy skies out for almost the entire trip) and waited for the rest of our tour group to finish their cruise. Once we were all gathered together again, we walked across the street from river to a bike storage area. 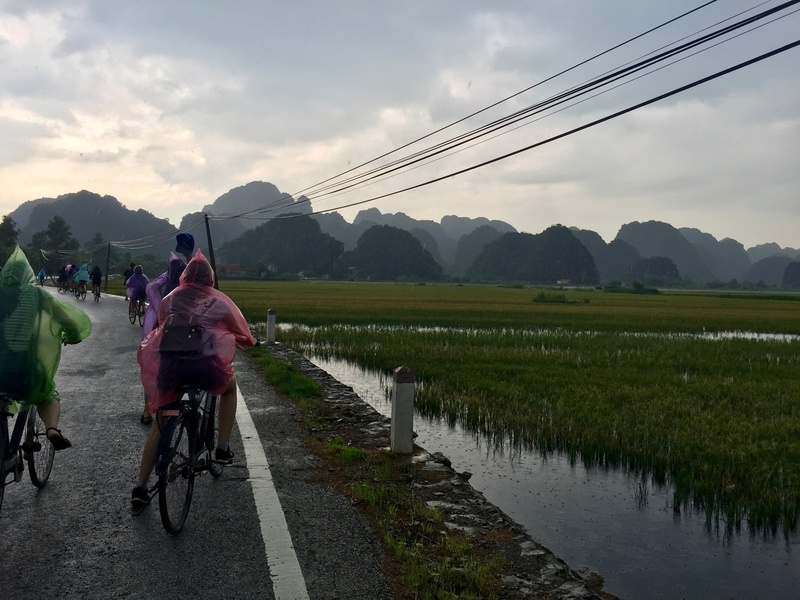 Our guide told us to grab a bike and follow her through Tam Coc. The town was small, but full of tourists and locals cycling, relaxing on their patios, or enjoying a late lunch at one of the few restaurants. It took less than 10 minutes on the bike to get out of the downtown area and out to the fields. Just as we headed off the main road and down a dirt path through the rice fields, the skies opened up and it began to rain... hard. The dirt path soon turned quite bumpy and slick from the rain. I found myself slowing down to avoid falling, but just as I did, I heard a loud scream ahead. After a packed day, we were ready to head back to Hanoi. We enjoyed a well-deserved afternoon nap on the bus, exhausted, but relaxed after a jam-packed day of site seeing, river cruising, and biking.